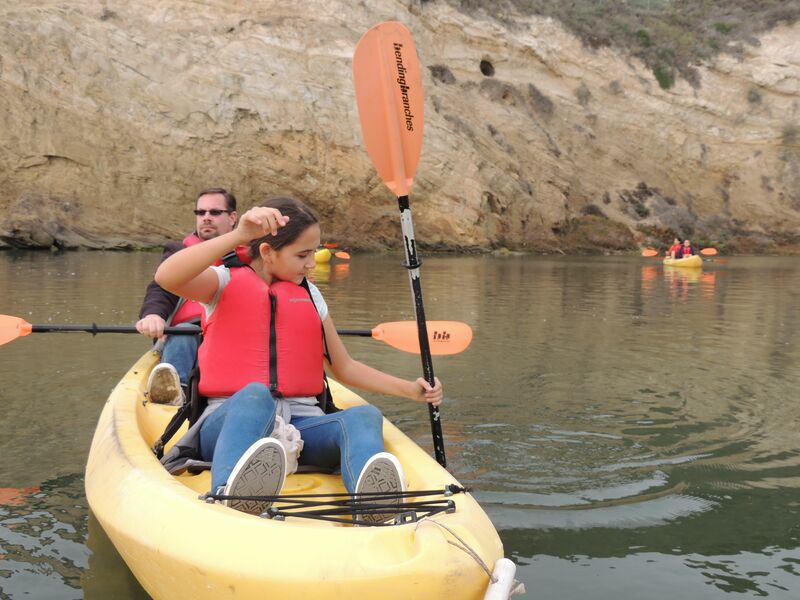 At 10am every Saturday and Sunday morning, kayakers and nature lovers from all over Southern California gather at the Newport Aquatic Center for a guided tour of Newport’s ecological reserve. A critical part of the Santa Ana Watershed, the reserve is on the Pacific Flyway, a kind of Route 66 for birds migrating with the seasons. It is the best place in SoCal to see birds from as far away as the Artic Circle, and is an important link in our global ecosystem. If you want to get up close and personal with nature and watch your kids faces light up as pelicans the size of a Labrador retriever circle overhead and dive into the water 10 feet away from you, this is the trip to take. Hunter spots a huge bird flying past us. You can explore this natural wonder in the midst of the city on a two hour guided tour with a naturalist leaving each weekend morning hosted by the Newport Bay Conservancy. Emily and Hunter already had an introduction to kayaking at Big Bear Lake, which is at the very top, or “headwaters,” of the Santa Ana River watershed, so it was appropriate that we go now to the outlet, where freshwater from upstream meets the Pacific Ocean in the Newport Bay Estuary. 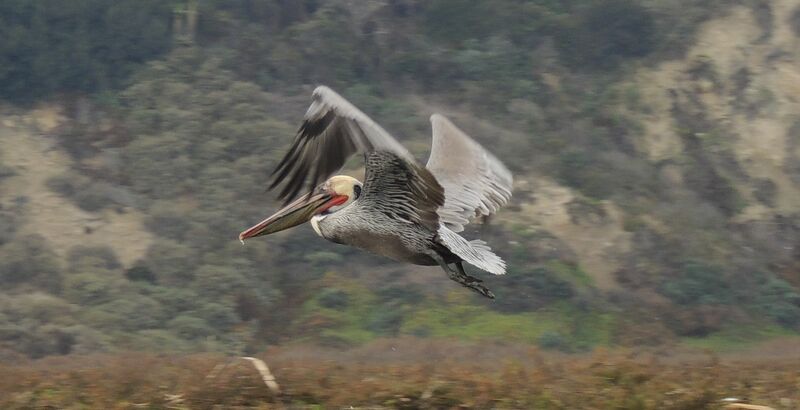 A brown pelican searches for its breakfast. Estuaries are home to an amazing diversity of life, as they are a unique place where fresh and saltwater mix. It’s especially crucial that this estuary and others like it are protected by water safety laws put in place by the Environmental Protection Agency. Just as the EPA ensures the safety of the tap water we drink, the water we release back into the environment must be cleaned and meet strict safety standards so as not to harm human health, or that of the natural world. The advantage of kayaking is that birds are not afraid of you, so you can get very close. While they are on the lookout for land predators and humans approaching on the shore, kayaks and their inhabitants aren’t given a second thought. Here are some of the coolest birds we saw. 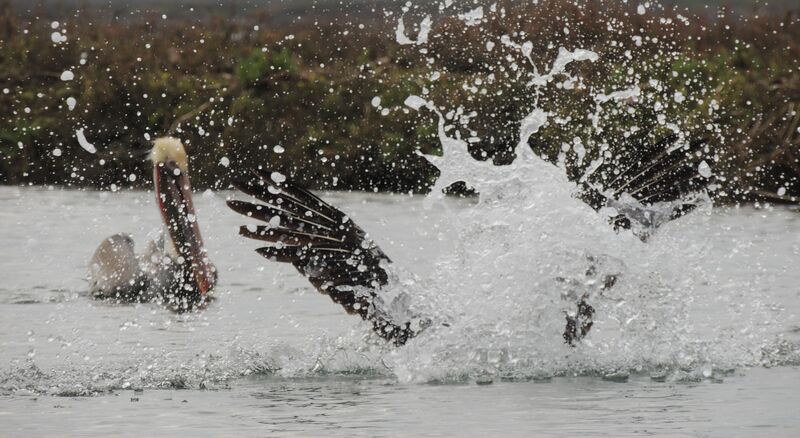 A brown pelican dives into the water about six yards from our boat! The brown pelican is one of the Endangered Species Act’s success stories. Put on the list in 1970 due to DDT poisoning, it has since recovered and was taken off the list in 2009. Browns summer in Mexico and two of the five Channel Islands, where they nest and raise their young. “Those ones just got here from the Arctic Circle three days ago,” said Portia, a volunteer naturalist who had just retired as an OC Parks ranger. She was pointing to three compact black and white birds with large heads for their tiny bodies (thus given the name “buffalo heads.”) These relatively small birds, just over a foot long with almost a two-foot wingspan, don’t look like they are meant to travel very fair. However, they came the farthest of all of the species in the estuary – almost 3,000 miles. This buffalo head (a small duck) just arrived from the Arctic Circle to winter in Newport. 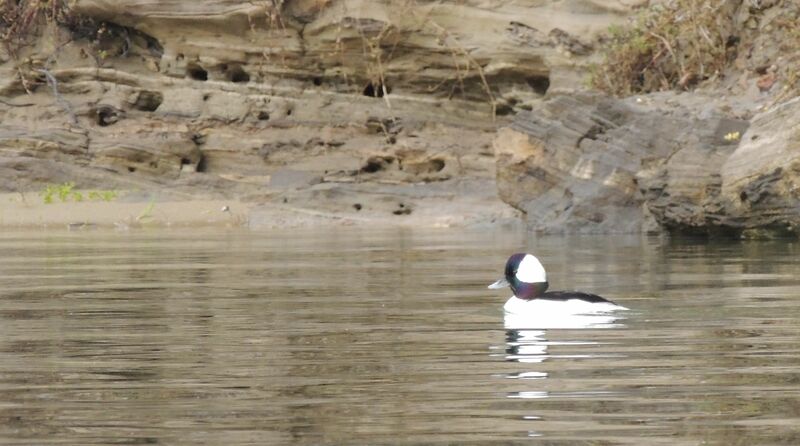 Buffleheads (or buffalo heads) are really a small duck. In the winter, they can be seen in the Gulf Coast and in Mexico. In Southern California, the Newport Bay Ecological Reserve is one of the few places with enough undeveloped estuary to provide a good habitat. 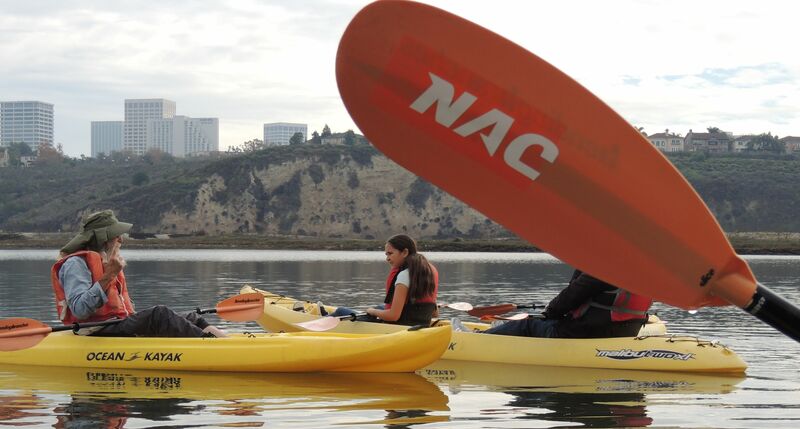 The Newport Bay Aquatic Center is a non-profit organization where locals come to train for rowing, kayaking, and stand-up paddle boarding. 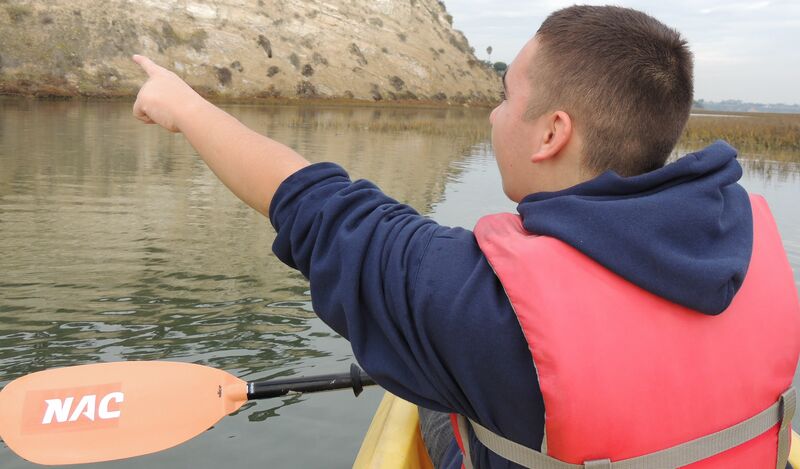 The Center hosts the Newport Bay Conservancy’s guided tours from their boat dock, and much of the cost of the tour goes back to caring for the nature preserve. The tour leaves from the Newport Bay Aquatic Center. 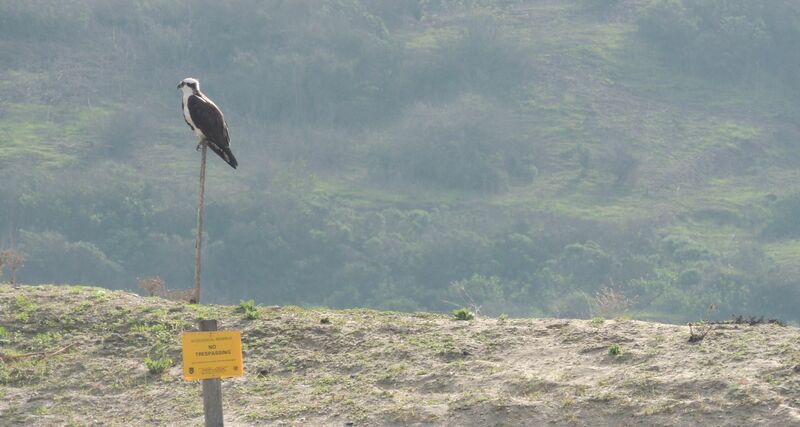 To Book: Call the Newport Bay Conservancy at (949) 923-2269 from Monday – Friday, 10am-4pm. The people who answer the phone are extremely nice and helpful. Be Sure to Bring: Hat, sunglasses, sunscreen (even in winter), shoes that can get wet, extra change of clothes, including underwear (just in case), camera, watertight protection for your phone if you bring it with you. One wonderful thing about the Newport Aquatic Center is that it has beautiful, spacious, newly-renovated bathrooms and locker rooms that you and your kids can change in, should it be necessary. Emily, Hunter, and I all needed to change afterward. Emily tests the water’s depth. The birds we saw on the morning tour eat fish, so it makes sense to visit one of SoCal’s most iconic seafood restaurants for lunch: the Crab Cooker in Newport Beach. 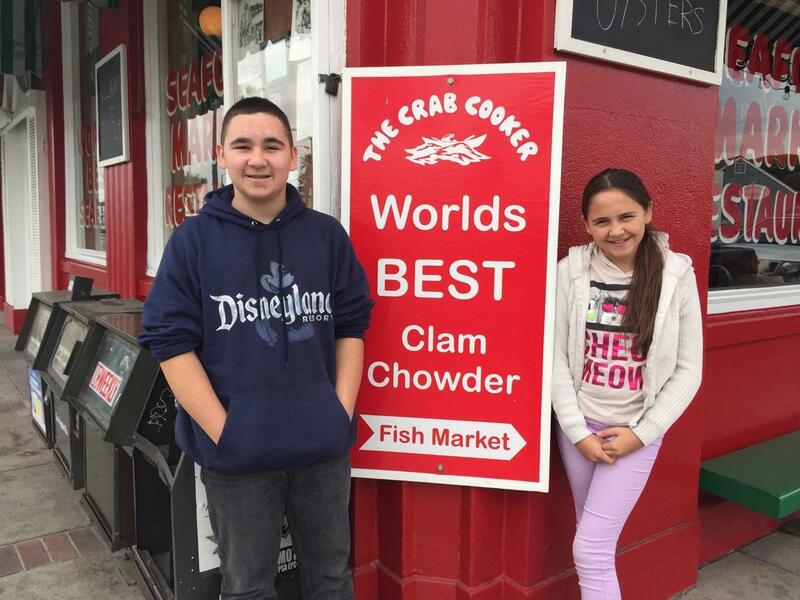 Only a ten-minute drive away, the Crab Cooker has proudly been serving Orange County since 1951. While they don’t have a kids menu, your little ones are sure to find something they like – from grilled shrimp to “the world’s best clam chowder.” With a casual atmosphere, it really is one of the best places to go when you are wearing exercise clothes look a little windblown. There are even adult beverages for those wanting to soothe sore muscles. One word of caution: there is likely to be a line.